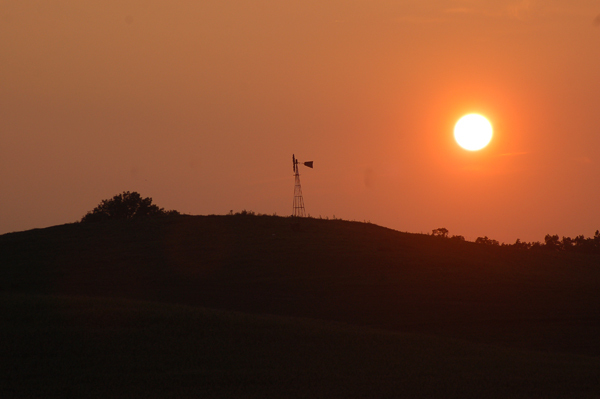 Hazy sunsets in Amish country are the norm in August. These are what I call August’s golden days. If I only referenced orangey sunrises and the hazy, citrus sunsets, that moniker would apply. August is so much more than lovely solar appearances and disappearances. It is always full of golden moments that make golden memories. I realize my reflections are provincial. In a world full of disease, disaster, dismay and hostilities, not all would share my august perspectives. However, I cannot deny what I have observed and experienced in this transitional month in Amish country. In calling August golden, I mean to take the broadest definition possible. Everywhere you turn, deep, rich yellows and golds appear. August is golden, too, in that it is good, providing success and satisfaction as the harvesting begins. Mowing and stacking the oats into shocks is the first step in the harvesting process for the Amish. August is usually a hot month in most of the northern hemisphere. Even the poor people in Moscow, Russia, where temperatures have seemed more like Dallas, Texas, have been especially suffering. True to form, hot and humid have been the bywords in Ohio, too. Those who have had to work out in these blazing elements would argue for sizzling and sultry as better descriptors. But no matter how we describe the daily dog days of August, the benefits surely outweigh the negatives, no matter how muggy. One wagon heads to the barn while the other returns to the field to be loaded again. 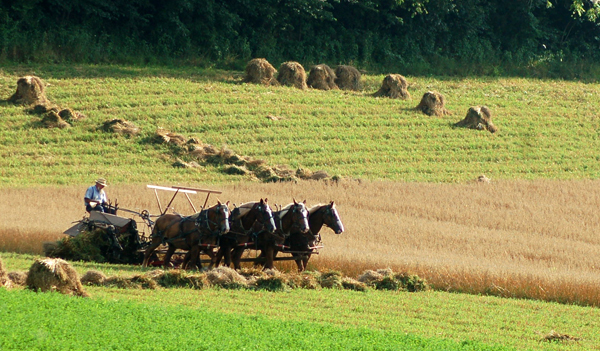 My Amish neighbor’s circle of friends purposefully gathers the air-dried, ripened oat shocks wagonload after wagonload. Their water thermos got a workout, too. With their cooperative efforts, the impressive stand of honey-colored sheaves had disappeared by day’s end. I always find it a miracle that once the sea of grain is cut and shocked, a carpet of bright green immediately replaces it. The hardy clover thrives all the more once it has the ground to itself. There are other kinds of gold in August, too. The Incredible sweet corn arrives almost simultaneously with the transparent apples. It’s husking, cutting, cooking and freezing corn one day, making tartly sweet applesauce the next. 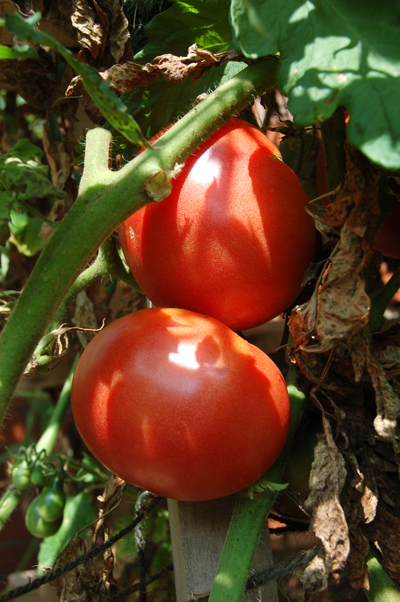 Heirloom tomatoes ripen on the vine. prolific, the plant runners get tied daily. Their yellow, red and green-striped fruit add to the festivities. 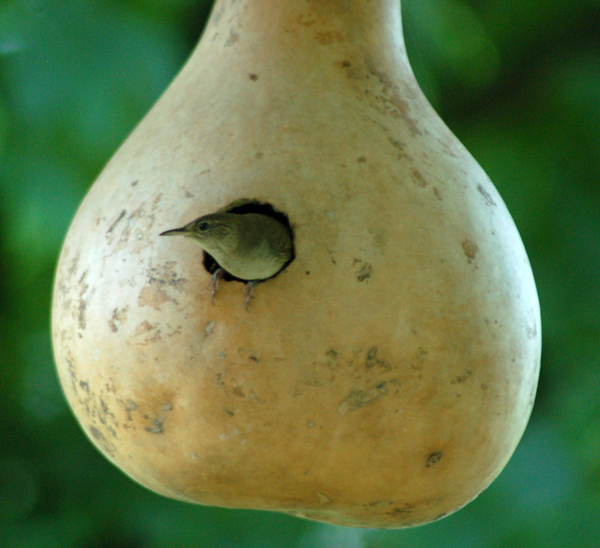 A house wren leaves the nest after feeding her brood. The noisy tan house wrens worked frantically to satisfy their last brood of the summer. Their hungry youngsters consumed an amazing amount of worms, caterpillars and insects. When the little ones began to greet their parents at the entrance to their birthplace, it’s nearly time for them to fly. In our case, the babies were there before church, but not when we got home. The grandsons and I found them learning to forage and hide in the brush pile under the pines near the hammock where other golden moments were made. Monarch and swallowtail butterflies joined the goodness of the month as they enjoyed the nectar of the milkweed and wild and domestic flowers. Both the black and yellow-billed cuckoo birds announced their arrivals as the tent caterpillars hatched. The much publicized but often under performing Perseid meteor showers still managed to send enough bright streaks though the new moon sky to extend the month’s goldenness 24/7. Next week the full moon will strut its stuff, casting a golden glow across landscapes, rural and urban alike. Ready or not, summer vacation has yielded to elongated yellow buses and excited, golden voices of children beginning a new school year. All things considered, August is a positively golden time of year. 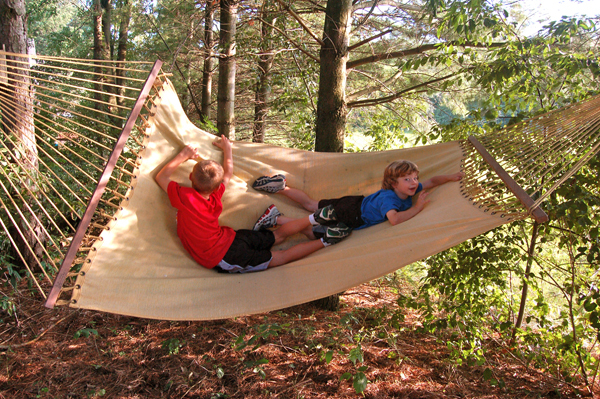 Playing on a hammock in the cool shade serves as a diversion from the August heat and humidity. Nice blog! Tx for commenting at my blog. I was just in Millersburg, Berlin, etc. My friends live in Homerville, right down the street from the auction. Thanks, Rhea, and thanks, too, for reading my blog. I hope you enjoy future posts as well.